We also serve all of the surrounding cities including Peoria, Surprise, Goodyear and all of the West Valley. Get your free estimate started today! 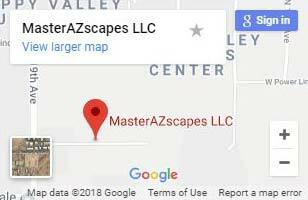 For quality retaining walls, Phoenix residents turn to MasterAZscapes LLC. Our full-service landscaping business ensures that every variable is considered. Retaining walls can provide amazing benefits, but only if they’re built by experienced professionals. Get the precision built retaining walls you need! Functionality – With professionally built retaining walls, Phoenix home owners get multi-purpose spaces. Retaining wall design can provide uniquely sectioned areas of earth. We can shape these areas according to preference. These can be used for plants, vegetables, or decor. Terraced steps create perfectly divided areas for your outdoor needs. Design – A retaining wall needs to be correctly designed. They are used for landscaping, but also as a functional way to contain soft earth. Monsoon season occurs every year. Retaining walls can be a great way to counteract the negative effects of erosion. We’ll design and build a retaining wall that keep your property safe. Aesthetics – Aesthetics can vary greatly. Retaining walls Phoenix homes fully incorporate include elements that match the home. This makes for a complete setting. We can build retaining walls using brick, stone, concrete, and more. 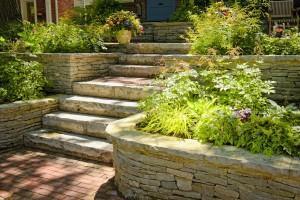 We work closely with you to create a beautiful retaining wall that enhances your property. Contact Us for Retaining Walls today! Our work is performed by extensively trained professional landscapers. From design to execution, we build exceptional retaining wall systems. For beautiful, useful, and strong retaining walls, call (623) 780-0474 or Contact Us today. © 2019 MasterAZscapes LLC. All Rights Reserved.